Flem is a fun little retro platformer that falls into the category of ‘hard as nails’ platformers, despite it cute exterior. It’s slightly less polished than its better known cousins, but a solid choice for genre enthusiasts. It’s impossible not to talk about Flem without comparing it to the likes of Super Meat Boy and Fenix Rage, so we’re not even going to try. 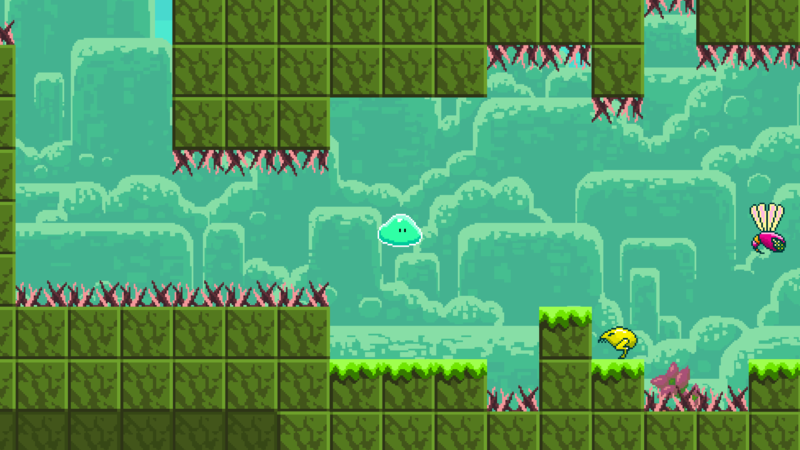 Just like those titles, Flem is a 2D platformer with an emphasis on difficulty and a tendency to walk the thin line between accomplishment and frustration. After the first few levels in Flem, which do a good job explaining the basic control concepts, the difficulty level ramps up dramatically. Well-timed jumps become essential, and before long you find yourself stringing entire sequences of moves together in order to stay alive and swerve through the many traps that face you. Flem is definitely more “retro” styled than the other two titles, since Flem’s graphics resemble those which we saw in the 16-bit generation of home computers like the Atari and Amiga – as well as the later 8 bit and early 16 bit console platformers. It’s a very basic look and feel, further emphasizing the core gameplay. The game’s music further enhances this throwback to the early 90s era, resembling a 16 bit version of the classic chip tune ditties of the 80s. This all makes for a much “cuter” look than you’d expect from such a title, but perhaps this helps with the inevitable bouts of frustration inherent to a game of this type. In the case of Flem, some of that frustration can also be due to controls that are a bit more ‘loose’ than the ones in Super Meat Boy – which is a shame. Still, frustrating levels never become impossible levels, so Flem succeeds in finding the right balance with its difficulty level. It might not become the indie classic that Super Meat Boy definitely is, but it’s surely worth a playthrough for fans of that game – especially if they’re interested a retro approach.